1) There is a huge hole in the bottom of the porcelain bowl. Surely, there is no way you are going to be able to control air flow with that. 2) The steel band that fits to the bowl is a great aesthetic feature, but its thinner than the porcelain and probably more conductive so you are going to lose a load of heat and what does it really add apart from looking pretty. Well I couldn’t really have been more wrong! The ash catcher slots in to the bottom of the bowl and ingeniously doubles up to regulate the air flow. This design has the advantage of doing away with more fragile moving parts and also making it incredibly easy to clean out the bowl after use. The steel band is a really nice feature on the grill. It is also integral to being able to adjust the grill to three different heights, as the bowl is then the same width over a greater range, allowing a 14cm height differential. This gives you more control when cooking and also allows you to drop the grill right above the coals when searing. As for losing heat through the band, well I can find no evidence of that. The grill is a real design thoroughbred. It seems very efficient on charcoal consumption and in fact you need to be very careful not to light too much coal if you want to keep temperatures low. On the contrary, it is very easy to get the cooking temp up above 250c. The cast iron grid itself I really like. It is hinged so you can easily place wood on the coals for smoking, or add more coals. The hinge itself is more of a hooked over part of the grill, which means you can easily remove the sides for cleaning and you don’t get grease stuck around the hinges. I really like the look of it with the Napoleon flames in the middle and the wave pattern. Like other parts of the design it is not just for looks, the wave design helps keep smaller things top side of the grill. Napoleon is a Canadian company that began life as a steel fabrication business in 1976. My review mentions “design” and “easy” a few times, so it comes as no surprise to me that Napoleon has lead the way with new and innovative patented technology across its ranges. The jury is out on whether the steel diffuser plate adds anything or not, I would lose that and include charcoal baskets which currently do not come as standard. Kamado style barbecues are having a bit of a boom in the UK at the moment. In a market that has always been a choice between green or red (Big Green Egg or Kamado Joe), there now seems to be a new option wherever you look. Even the supermarkets are getting in on the action this year selling unbranded and unknown brand kamado style grills at seemingly very competitive prices. There must be over 15 different brands and models available now in the UK market, most of which seem to be coming from imported brands with no presence behind them. So whilst paying sometimes less than a quarter of the cost of the main two players for what looks like a similar grill may seem like a good deal, is it really? One thing we have learnt over the years about ceramic is that it is delicate, and heavy. Very very heavy. So you pretty much need to pick a spot for your ceramic grill and not consider moving it for a while, and of you do decide on a change of spot then proceed with caution as knocking that grill over is not an option. But what are your other options? Well, in the last few years an alternative to ceraminc kamado’s has also stepped forward in the form of the double walled steel versions with insulation in-between. So is this a good alternative? We were very kindly sent the Charbroil Kamander to test out and see if it stands up to the test. It’s always a good day when a new grill arrives and when this bright yellow Charbroil box arrived on a pallet it was smiles all round. There were two of us unpacking and building the Kamander and it took us around 45 minutes to put together and was pretty straightforward as we actually followed the instructions for once. I know the usual process is bin the instructions and see what happens and keep them for fire starters later, but we wanted to do this by the book. There is still a little weight to the unit so definitely worth having that second pair of hands available. The pay off was the first feast off the grill for helping out which was deemed to be more than a fair trade. So let’s start with the weight. The Kamander comes in at around 52kg which is about a two thirds of the weight of its equivalent in a ceramic kamado grill. So a fairly hefty chunk lighter but don’t forget the Kamander also comes set into it’s own wheeled cart with folding side shelf. Figure that into the equation and you start to see this is a fair whack lighter than similarly sized ceramics. But does lighter mean a drop off in performance? We have put the Kamader through a whole host of different cooks to see. The cart the Kamander is set in is pretty sturdy, if you clip the lid shut then then large handle acts as a grip to lift and roll the whole unit around with on its back wheels. The Kamader grill has been stored a few meters away from the cooking area and moving it across the patio and grass was easy thanks to the large rubberized wheels. The side table on the cart pulls out and drops to the side whilst remaining attached so that the storage space needed for the grill set in its table is less when stored and covered. This handy side table is helpful for many things including preparation, holding ingredients or fuel or even your BBQ cookbook of choice. There are also a number of tool hooks off to the side of the table making it handy to hang your tongs and grate tool etc. These are a little fiddly as they sit underneath the lip but a few attempts has your tools safely stored and out of the way. But the side table in this instance serves a bigger purpose, as a quick glance shows a daisy wheel vent housed to the back right of the grill itself inset into the table. This is part of the very clever vent system that Charbroil has used on the Kamander making it easy to make temperature vent adjustments without having to lean under the grill. Whilst not an issue for most to lean under a grill, anyone suffering with back issues could find this really useful when combined with the lighter weight of the unit itself. All the usual features are there such as a temperature dial that reads up to 425c. Yes that’s Celsius not Fahrenheit. A giveaway about how hot this unit can get with its insulation. The gasket between the lid and the main bowl is not of the felt variety that has been seen on most kamado units until now, but is the new style and harder wearing braided unit that compresses when the lid is clipped shut to form a tight seal and also acts as a cushion should you drop the lid. There is a latch to clip the lid shut to form an airtight seal and a large lifting handle. As the grill is steel construction and not ceramic the lid does not weight a ton making them hard to lift one handed as with some grills. The cooking grates are porcelain coated cast iron so hold heat in really well for those classic grill marks on steaks but also remain easy to clean too. The grate comes with another neat feature as it is in 2 parts. There is a very small section at the front that is removable with a handy tool CharBroil include that means you can easily top up on fuel or smoking wood mid cook. This doesn’t fit 100% tight for the first few cooks and feels like it could slip, but get a few cooks through the grill and it holds much tighter in place. There is also a very handy removable step up grill included with the kit there are 2 slots (left back and right back) that this can be slotted into, and then there are also 2 heights that the step grill can be set too. Very handy for those cooks where you need some extra space or it can also be used to separate food types if needed or also as a warming rack. But another neat feature of this is that is can swing out to the side of the grill giving you total access to the food on the main grill or act as a super cool zone away from the grill surface if needed. Underneath the grill there is a hanger in which you can place the drip pan which also acts as a diffuser for smoking creating an indirect cooking set up, but also can be used as a water pan if you so wish. The pan isn’t very deep so would probably require fairly regular top up’s during those really long low n slow cooks. We have been foiling it during cooks to keep it clean. Working your way down you have the charcoal grate, then at the very bottom of the grill sits the ash pan which has the air flow holes drilled into the sides at the top. Thankfully this pan is very deep meaning you can crack though a fair few cooks before it needs emptying. But they have thought the design of this through well and it has a lifting handle across the middle for easy removal. So having had the Charbroil Kamander unit in the line up for 3 months now and having cooked upwards of 20 cooks on it, I have to say I am very taken with it. Having yearned for a ceramic kamado grill for a number of years getting the opportunity to try the Charbroil Kamander was one I grabbed with both hands. I have cooked everything from a 14hr low and slow pork shoulder, chilli brisket, spatchcock chicken and lamb ribs right up to high heat steaks, seafood and even some brownies and it has coped well with everything I have thrown at it so far. The side table really plays a big part here with having somewhere to rest plates, rubs, glazes and tools which is something none of my other barbecues have. The built in tool hanger is very handy in keeping the table surface clear or tongs and lighter. It has taken some adjustments in my cooking technique to learn just how much heat these type of grills retain but learning is what makes BBQ fun. You definitely need to light less charcoal or briquettes on start up with these types of grill as once the insulation kicks in the temperature will climb rapidly and given the chance it will shoot over your desired cooking range. So some minor adjustments where needed in my cooks to ensure the temps stays level as the grill does want to cook hot. Briquettes are definitely recommended for low n slow cooks to keep in that 107c/225f-135c-275 sweet spot. The pork shoulder was cooked using heat beads briquettes and it sat in this range for the whole 14hrs with minimal vent changes during the cook. The one thing you will find is that the vents need to be shut down a lot lower than on some grills due to the nature of the insulation, again too much air going in will make the temperature rise above you desired cooking range as with any grill. For higher heat cooks this grill comes into it’s own. The charcoal grill is a little lower from the cooking grates than on some grills but this doesn’t seem to affect it. A good covering of some good quality lump charcoal on the grate can be lit and have you up to those 425c-797f high heats for the perfect sear in no time at all. One simple cook of some Sherwood foods Tomapork with a simple salt and pepper rub and some oak wood chunks had one guest asking how it was possible to get so much flavour into pork. That was a good moment and cemented the fact that the Kamander has it’s place in the barbecue line up. The big players in the market make amazing units and have great reputations for quality and after care, but the cost makes them prohibitive for most people. The Charbroil Kamander comes in with a recommended retail price of £699 in the UK making it very very competitive against most other brands out there. But there is one small sticking point in that this grill sells at a lower price in the US. But that said, taking into account that mark up applies to every other grill and product imported into the UK, you can see that it’s something you have to swallow and that it’s still a very good deal. Also, if you keep your eyes peeled there have been some deals around for as low as £499 saving you a massive £200 and making the Kamander a no brainer in its market. Once again the Kamander grill was supplied to us for review but we are free to add our own thoughts and have been honest and fair in our review. Everyone loves a good barbecue in the summer, great food, family and friends plus the sunny weather makes it the perfect time to get your grill on and impress. But barbecuing doesn’t have to be left for those brighter months and special occasions – use your grill throughout the year with some top tips from Napoleon Grills national sales manager, Martin Sobey. “If the kitchen is the social hub of your household, you might not want to cook indoors whilst you’re entertaining. Bring the party with you and grill outdoors for a fantastic meal that keeps the smells out of your home too. “Summer never seems long enough and with the unpredictable British weather, who knows when you’ll next get a chance to have that barbecue? Grilling outdoors is possible all year round, even if the weather is cold and snowy. Napoleon barbecues are built with high quality 304 stainless steel, meaning that not only will your grill last for years, but it can withstand both high heat and extreme cold. “It’s important in colder weather not to open your grill too often whilst cooking and to keep a timer close so you can pop inside if the temperature drops. Foods that cook faster, like burgers and chicken breasts, will minimise the time spent outside but are still great meal options, and what better way to add flavour than roasting on the barbecue? “Birthdays, Father’s Day, even Christmas, there’s always an occasion for you to show off your culinary skills, but does the barbecue always have to be limited to special events? Why not expand your kitchen and try making your family meals on the grill? 3 spears of Tenderstem broccoli blanched. Roll or stretch your pizza dough on a floured worksurface to around 10-12 inches. Spread the passata, then add the veggie toppings, and drops of mascarpone, then arrange the Tenderstem spears. Bake on a BBQ pizza stone or in a wood fired oven for 60-90 seconds (or in a hot domestic oven for 8-10 mins). Slice and enjoy! Divide your dough ball into four equal pieces, and roll/ stretch into rough oblong shapes. 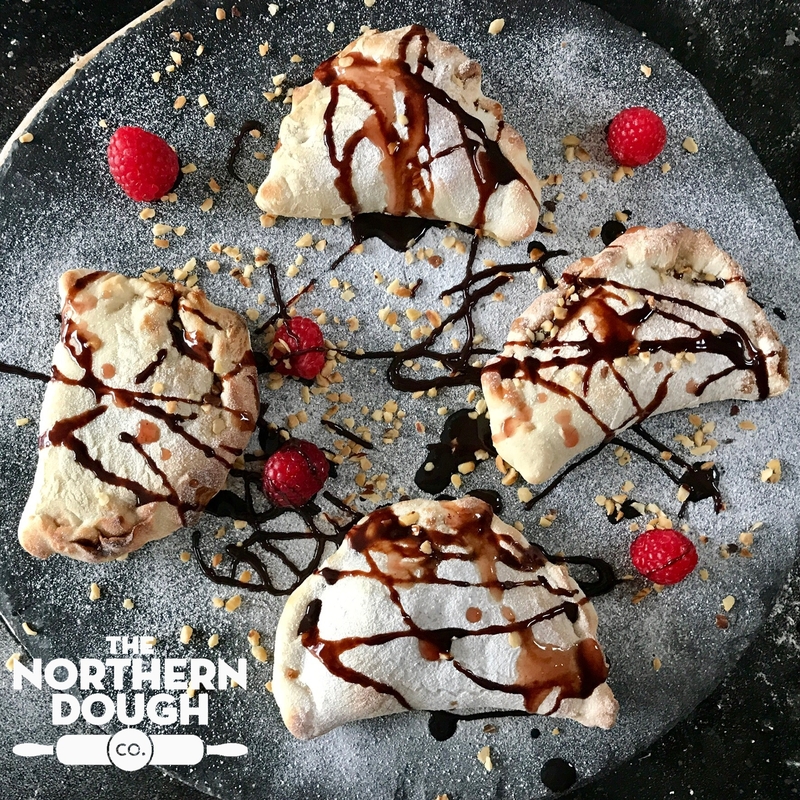 Spread half of the surface of each piece of dough with a tablespoon of chocolate spread, and add a few raspberries and a sprinkle of hazelnuts. Fold the dough over so that the edges meet and pinch together to make a tight seal (like a pasty). Bake in a wood fired oven for 20-30 seconds ,or in the bbq or a hot domestic oven for 3-4 mins). Sprinkle with icing sugar and the chopped hazelnuts and serve with a pot of raspberry coulis for dunking. I first saw the Beefy boys doing burgers on a plancha, early this year I started to see a few people cooking on the smokerig plancha I thought to myself that looks like a cool bit of kit and promptly bought one. When it arrived I was impressed with how heavy it was, 11kg and 6mm carbon steel which is supposed to conduct the heat very effectively. Before cooking on the plancha you need to wash and season the surface to create that natural non-stick coating. This is the same process as seasoning a steel wok or cast iron cookware. The seasoning process is the baking of a thin layer of oil into the surface of the metal. Repeating the process helps build up the layers of baked oil and gives the steel a dark tanned shiny appearance. I lit ¾ of a chimney of charcoal and when it was ready to go I tipped it into the bbq leaving an area with no charcoal, this would mean that one side of the plancha where the coals where, would be very hot and the other side with no coals under would be cooler. I put the plancha on and the lid of the bbq and waited about 10 mins. I then tested the temperature with an IR Thermometer. The plancha definitely conducts heat effectively.The hot side was about 250c and the cooler side was 180c. If you want, you can put an even layer of charcoal under the plancha and obviously less charcoal means less heat if you need to cook something more slowly. As well as the McMuffin, I have cooked steaks and fajitas and smash burgers , the size of the plancha means you have so much more cooking space than you would on a griddle pan and the solid surface helps create a great crust on your steak or burger. You can see some pictures of my cooks below. I know some of the rest of the team have cooked, pancakes, drop crumpets, a full English breakfast and philly cheese steak. So all in all the plancha is a well-made bit of kit which has quickly become an essential and I can see myself using for many years to come. When it comes to cleaning the plancha this is very easy, while it’s still hot I scrape the surface with a metal scraper or spatula and wipe down with a paper kitchen towel. If there are any burnt bits stuck to the surface I spray water and scrape again. Before storage and to help build the non-stick surface I add a film of oil before storing away. 1. What got you into BBQ’ing? 2. How many BBQ’s do you have at home? 3. Favourite piece of BBQ equipment. 5. A dish you’ve never cooked but would love to try? 6. Best BBQ food you ever ate? 7. Person you would most like to cook with? Lennox Hastie, Firedoor, Surrey hills NSW, Australia. We worked together at Le Manoir when I first started and he has gone on to have one of the best restaurants in the world cooking on only wood fire. 8. Favourite song to cook too? 9. Best toppings for a BBQ burger? Homemade chilli sauce, fresh pickled onions…..as well as all the usual suspects. 10. What’s your favourite non-BBQ food guilty pleasure? 1. What got you into BBQ’ng? I’ve had a love of cooking since childhood, so cooking outdoors was a natural progression, that and a fascination for fire! 2. How many BBQ’s do you have at home and what is your favourite method of cooking? Err, I may have to plead the 5th on that one .. don’t tell anyone but I have around 17 at last count. I can’t narrow down my favourite way of cooking, but I love the indirect low and slow cook that my GMG Pellet Grills give me as well as cooking indirect and searing on my Kamado, it really depends on what I’m cooking. 3. What is your favourite piece of BBQ equipment? This can be a BBQ or an accessory and we want to know why. Probably my Cold Smoker (which I use with my ProQ CSG), partly because my other half Dave made it for me, complete with Perspex door so that I can see what’s going in inside, but mainly because without it, there would be no bacon!! 4. What was the best BBQ food you have ever eaten? That’s easy! The best BBQ Food I’ve eaten is with friends at BBQ Competitions mainly in America … the relaxed evening cookout before everything goes mental. 5. Tell us about your worst BBQ disaster? Almost setting fire to a 12th century Tythe Barn during a catering event years ago! I left my cooker in the ‘capable hands’ of my late husband only to come back and find that he had let things get a little too Hot! 6. Name a dish you have never cooked but would love to try? I’m not sure there is one! If I really want to try something I’ll always try cooking it. 7. Who is the person you would most like to cook with? I usually cook alone, but I’d like to cook with like minded people who share my passion for BBQ and like to have some fun. 8. What is your favourite song to cook to? Anything from Queen is a good start for me as it drowns out my singing! I absolutely love to bake, so anything that involves cake! Richard Holden BBQ is on a mission to bring brilliant barbecuing skills to more people across the UK. He travels the country leading live product demonstrations, hosting bespoke hands-on masterclasses and catering for private events, with the aim of educating and inspiring others to get creative with food and give barbecuing a go themselves. I had my eyes opened to home barbecue when I first had roasted meats and vegetables cooked outside. It was around 2004, I’d just moved to Canada and with the stonking hot summers they get out there my sister was buying all the barbecue cookbooks she could get her hands on and fast became a BBQ Ninja!! I started to take barbecuing seriously in 2012 when I took a job working for Weber as an in-house chef. I began travelling the UK and Ireland with their amazing Land Rover and Airstream exhibition unit hosting mini masterclasses at retailer locations and big food shows such as CarFest, Grillstock and Jamie Oliver’s BigFeastival. I loved how people gather around the barbecue and along with creating great food together the barbecue inspires newly treasured memories and life moments! HAHA At last count I had 15 barbecues of various descriptions. These are working grills and go on the road with me to the events I host. There are charcoal, gas and pellet barbecues as well as dedicated smokers and portable styles in there too. My favourite method for cooking has to be roasting as it opens up the endless possibilities of what you can cook on your barbecue. Roasting also allows the barbecue to take the strain while you have time on your hands to do other things be it things around the house or actually catching-up with the people you invite to your home. In the same way as The Complete Work of Shakespeare and A Religious Book are automatically given in Desert Island Discs I’m going to assume we already have a chimney starter, a good toolset, IO Shen knives and a Thermapen!! This being the case I would have to say my cast iron Dutch oven is something I could not be without. One of the best things about cooking on a barbecue is that for grilling and roasting you don’t really need anything to put the food on like you would in the kitchen as food goes straight on the cooking grate. This is fantastic when it comes to washing up, but there are times in the year where I want to be able to cook something outside the norm. Chilli con carne on bonfire night or moules mariniere with crusty bread and a glass of white on a warm summer evening are just 2 dishes that instantly spring to mind. The Dutch oven is in my Top 10 pieces of barbecue kit for sure! I’ve been lucky enough to judge twice at the Jack Daniel’s International BBQ Championships so it goes without saying I’ve eaten some of the best barbecue food in the world. The other worthy mention though has to be the first time I ever ate low ‘n’ slow brisket! It was July 1997, I was visiting Canada with my parents for the first time and we were at the Calgary Stampede (google it!). As we walked around the park grounds I caught the very distinctive aroma I’d later come to know as hickory wood smoke. This was a taste revalation and if I ever think of hickory smoked brisket now I’m straight back at the Stampede that summer; Fantastic! Easy! Grillstock Bristol 2014. I was heading up the weekends 30-minute demos in the Weber marquee and someone asked me a thought provoking question that got me off topic! My school reports always said “easily distracted” so I went in feet first and forgot what I was supposed to be doing. What I was actually cooking was a Tarte Tatin, which had had the puff pastry lid put on and was on the barbecue to bake off. Mid conversation someone asked if the barbecue behind me was supposed to be smoking. I said it wasn’t possible as I was just “baking” but true enough when I turned around I saw heavy black smoke coming from the grill. I’d baked it too far long and not only had the pastry “over-baked” but the caramel in the bottom of the dish had burnt to smithereens. I’m dying to get my own house to be able to have space for an Asado and cook a butterflied lamb or side of beef on it! I’ve seen it done at events like Meatopia and spoken with people about it but haven’t had the opportunity or space to do it for myself yet. Australian cook and food write Donna Hay. There have been so many influences for me from Australia in the last year and Donna is just one of the people I’ve discovered along the way. Her food and knowledge are vast and to cook with her while discovering Aussie cuisine would be something pretty cool! I have music playing most of the day so this is tough but “I Gotta Feeling” by The Black Eyed Peas will always remind me of a sailing trip I took around the Whitsunday Islands in 2010. In my mind it’s tropical blue waters, hot sunny days and barbecues off the back of the boat whenever I hear this song! I like to keep it classic with cheese, grilled streaky bacon, tomato and sliced avocado.